Marcus Rashford celebrates his late goal with Chris Smalling and Tahith Chong. Chris Smalling celebrates after Marcus Rashford netted an injury-time winner. 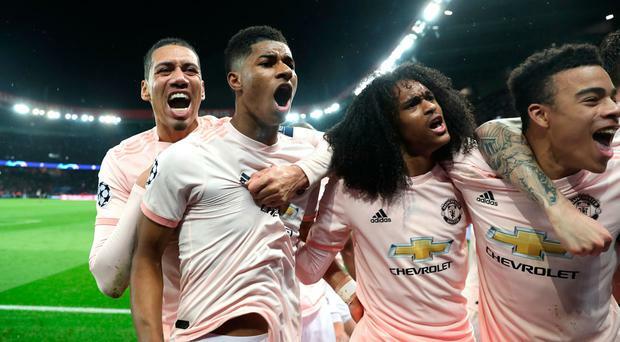 Manchester United have reached the Champions League quarter-finals, winning their round of 16 tie against Paris St Germain on away goals after a 3-1 second-leg victory in France ensured a 3-3 aggregate result. There was late drama as Manchester United were awarded a penalty via Video Assistant Referee when Presnel Kimpembe, turning his back, was adjudged to have handled a Diogo Dalot shot as it struck him in the box. Marcus Rashford converts from the spot after VAR awards the visitors a late, late penalty! Rashford stepped up and completed a stunning comeback with a well-struck shot in stoppage time. United had led 2-1 at the break thanks to Romelu Lukaku's brace, the second thanks to a uncharacteristic error from veteran PSG goalkeeper Gianluigi Buffon. Thomas Tuchel's side rallied and looked set to roar ahead after Juan Bernat turned home Kylian Mbappe's cross, only for Gianluigi Buffon to spill a hopeful Rashford shot into the path of Lukaku. Kimpembe was adjudged to have handled a Diogo Dalot shot after referee Damir Skomina looked at the incident on a monitor - and Rashford did the rest. Rashford, when asked what he was thinking as he stepped up to take the penalty, told BT Sport 2: "Just keep a cool head. They are the type of thing you practice every day and I wanted to take it. "That was probably the hardest thing, the wait before, but it's all part of the game and those moments, that's what we live for." Rashford continued: "Everything seemed to be against us but we're used to surviving in these moments. Today just proved that one more time. "We go forward from this game now, keep pushing and better ourselves. It's a beautiful thing (seeing the club's youngsters on the pitch). We have 10 players injured but for them, it's an opportunity for them to come forward and they've all done that."